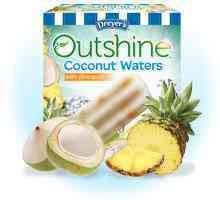 Recently came across a refreshing, great tasting allergy~friendly snack, or 'delicious popsicle' as my kids would call them. This company promotes this product as being 'kosher', 'fat-free' and being 'made with young coconut water and real pineapple'. What they don't point out is something that you may find incredibly appealing. According to their ingredient list, they are also dairy-free, egg-free and nut-free. 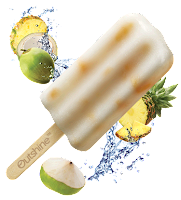 Outshine Coconut Waters with pineapple, distributed by Nestle Dreyer's Ice Cream Company, 5929 College Ave., Oakland, CA 94618. Ingredients include: COCONUT WATER FROM CONCENTRATE (WATER, COCONUT WATER CONCENTRATE), SUGAR, PINEAPPLE, MODIFIED CORN STARCH, GUAR GUM, CAROB BEAN GUM, ASCORBIC ACID (VITAMIN C), CITRIC ACID, NATURAL FLAVOR. Worried about the 'natural flavor' ingredient or what their cleaning protocol is like? 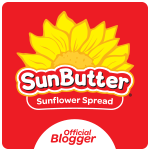 I spoke with one of their incredibly helpful customer reps. She assured me that if there 'were any of the top 8 allergens in this product, they would have it listed'. She also went over their focus on stringent cleaning protocols in place for cleaning the equipment lines. I suggest you also call if you have any questions or concerns. I also love promoting a company who is so strongly involved in giving back to their community. Their 'Communities Take Root' program over 60 orchards yielding 88,000 pounds of fruit had been planted in deserving neighborhoods across the U.S.
Can't wait to try their Coconut Waters with Banana next! If you do, be sure to let me know what your thoughts are! 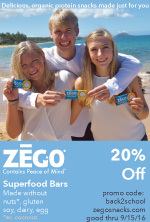 As they say, "simple, honest ingredients that taste as good as they make you feel - and refresh from the the inside out!